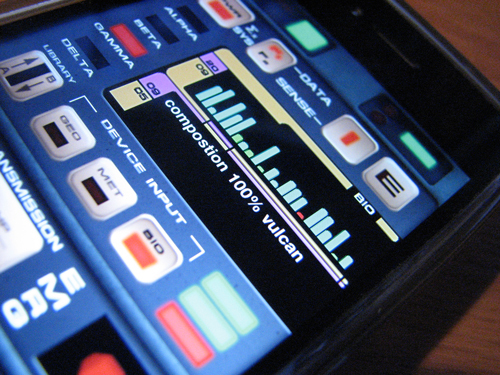 This is the first in a series of posts about useful iPhone apps for film and video production. In the past few months, during my shoots overseas, I have been confronted by producers, crew members, drivers, waiters, and ordinary folks on the street, using iPhones for texting, tweeting, gaming, emailing, translating, navigating, Facebooking, computing currencies, listening to music, showing photos, shooting video, sometimes even talking on the phone … and exploring new apps created to help people like us, who work in film and video production. Apple products have long been popular with folks in the visual media. In the US, I am used to seeing Macs and iPhones on production crews; sometimes nearly everyone has one! But recently, while traveling in the Netherlands, Switzerland, Germany, Brazil, and, to some extent, China, it’s been hard to miss the remarkable proliferation of the iPhone. This surge in iPhone sales abroad was not unexpected. 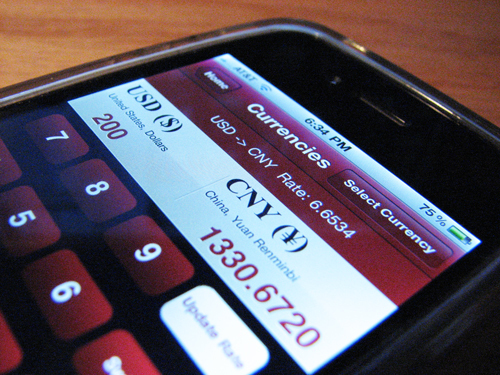 Early last year, Apple projected an enormous increase in its iPhone exports. Yet in September, when I found three Swiss cabbies in a row with their personal iPhones mounted on their taxis’ dashboards, I was still taken by surprise. I have long admired (and sometimes been involved with) the wild proliferation of previous world-changing, market-defining products from Apple. I shot the video which Steve Jobs used when announcing the first iPod (and the first iMac and the swing-arm iMac and the iTunes Music Store, for that matter). For the iPod project, I shot musicians, artists, and filmmakers, reacting for the first time to the little white box. For a few months after the product release, I felt a special bond with Wearers of the White Earbuds. After a couple of years, however, everyone had an iPod, and though I still loved the ease of music playback, iPod ownership no longer fed my adolescent need to feel special. Then the iPhone came along. I bought the first version a few months after release, then later an iPhone 3G, and now a 4 (recycling each castoff to my son). For a while I belonged to a special club. The Droid was still a rumor, and only those of us with these odd, blocky, rectangular communication devices had apps … which could do anything. Three years ago, before the iPhone had been introduced in Japan, I took mine to Tokyo on a job, and enjoyed showing it off to my friends and colleagues. I gamed, I emailed, I navigated, I Scrabbled, I wasted time. One of my first apps let me watch koi fish in a pond, listening to them splash and gulp. How cool was that? I mean, really, wasn’t this the raddest gadget ever, like Spock’s do-everything Tricorder in Star Trek? Of course, there’s an app for that, too. But by now, everyone has an iPhone or some other smart phone of similar shape and somewhat equivalent capabilities. Some of the bloom has left the rose. Nevertheless, I was happy to have my new iPhone 4 tucked in a pocket as I left in mid-September for our first shoot in Nieuwegein, near Utrecht in Holland. Switzerland, the Netherlands, and others had just gotten the iPhone 4 at the end of July. My gaffer (chief lighting technician) was Roel Tanghe, a Belgian I had worked with earlier in the year, with great success. On our scout day, Roel showed me an iPhone/iPad app I’d never seen before, ponderously named Sun Seeker: 3D Augmented Reality Viewer, which can predict the sun’s position in the sky at various times today, tomorrow, or any day of the year. 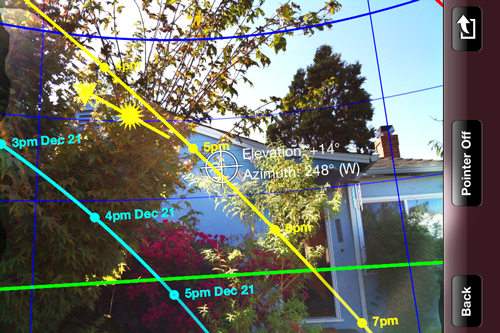 Correction: it doesn’t just predict, it shows you where the sun will be, using the iPhone’s camera as you point it at the sky (See insert for more on Augmented Reality). Obviously, when you’re shooting outside or near windows or skylights, it’s always useful to plan shots around the sun’s position, especially on clear days. Will our star (and our hugest light source) be in front of or behind the subject, to the side, or high overhead? I’ve long been a fan of sunPATH, a computer application that charts the sun’s position every 15 minutes, any day of the year, any place on the planet. Using a massive database of 39,000 place names, sunPATH can help predict the sun’s position with great accuracy, and I’ve written about it, taught it in my cinematography and lighting classes, and used it for years on productions all over the world. sunPATH’s biggest drawback is that you must bring with you into the field: (1) a computer, or printouts of sunPATH’s sun chart, which takes a bit of planning, (2) a compass, and (3) a clinometer (which measures the sun’s height above the horizon). I use a Suunto Tandem combination compass-clinometer, which costs 200-300 bucks, and before leaving on my trips overseas this fall, as always, I printed sun charts for Utrecht, Geneva, Hamburg, and Sao Paulo. The folks at sunPATH, by the way, are working on an app too, but it hasn’t been released yet. 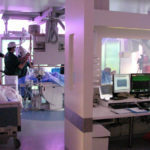 Roel used Sun Seeker in a window-lined hospital hallway in Nieuwegein on a Monday, to predict whether the sun would stream in when we filmed there on Wednesday morning (it did). This new app is computer, printout, compass, and clinometer, all in one, all in your phone, always in your pocket. I downloaded it immediately, but didn’t have time to learn it right away. We had to move our shoot quickly through several countries, so I continued to rely on my printed sun charts in Europe. When I got to Brazil in early October, my gaffer there, Walerio Rosa, also had an iPhone. Brazil has lots of iPhones, despite their shortage there. 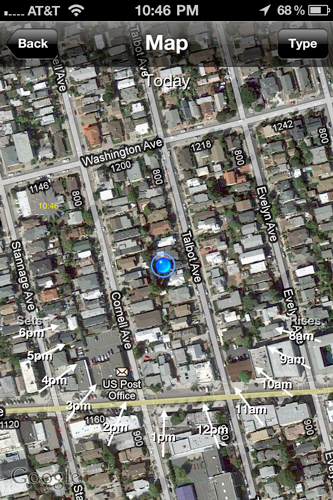 And of course, Walerio had Sun Seeker on his phone and teased me about still carrying around my Suunto and printouts. Also, I hadn’t realized that our location in Brazil, Ribeirão Preto, was nearly four hours’ drive from our landing in Sao Paulo, so the sunPATH charts I had printed at home for Sao Paulo were off by a few minutes. That didn’t matter, really, but it did make the Sun Seeker app’s immediacy instantly likeable. So I spent a little time learning the various views and options in Sun Seeker. Clicking the “i” on the Flat Compass View shows some helpful explanation. When I left for China in late October, I didn’t even print sunPATH charts (though I did bring my Suunto). I did see lots of iPhones in Beijing and Shenyang, despite reports of lagging sales in China’s nascent smartphone market, but not like the saturation in Europe. Flat Compass View for Bay Area location 10/12/10. This reading was taken at night, indicated by the sun on the grey night path line. 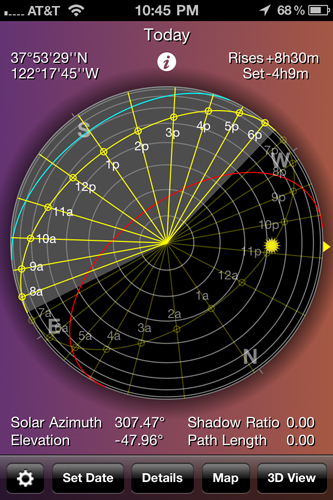 When you boot up the app, it defaults to the Flat Compass View, graphically displaying your location at the center of the compass, and the position of the sun during the day as a yellow line, with small yellow suns at hourly azimuths (compass points) and elevations (angles above the horizon). A larger, solid yellow sun represents the sun’s position at the moment of reading. A grey line shows the night path of the sun behind the earth on that day. A red line indicates the sun’s positions on June 21st, the spring solstice, and a teal line shows December 21st, the winter solstice, illustrating the range of the sun’s reach at that location through the year. Handy if you’re planning a garden, or a house. The grey, red, and teal lines can be turned off, for simplicity in reading. 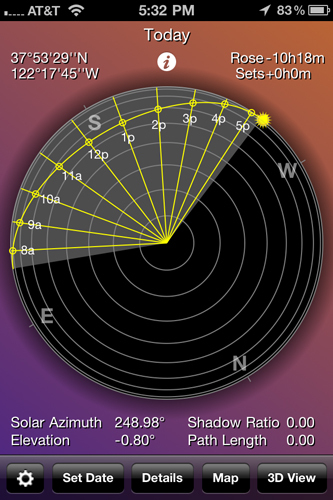 Numeric displays in Flat Compass View also show latitude and longitude for your location, length of time since sunrise and till sunset, solar azimuth, elevation, shadow ratio, and path length (all explained by the in-app help file). 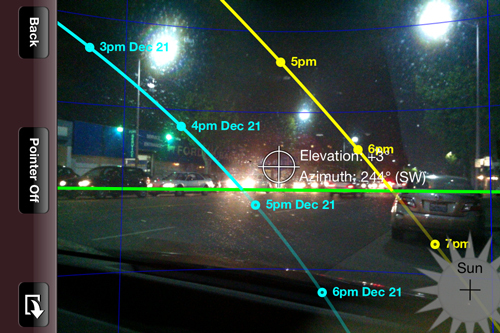 Flat Compass View for same location 1/30/11, with solstice and night path lines turned off. This reading was taken just after sunset. Sun Seeker makes it easy to take a reading for another date (ie, not today). Sun Seeker defaults to your current location, however, and it’s not possible to input another location for the Flat Compass View or the Map View, either by entering latitude and longitude, or (as with sunPATH) by choosing a place name out of a database. In this respect, sunPATH holds an advantage as a tool for long-term planning. In the past, I’ve also used sunPATH to post-research stories I’ve written, true accounts of travels in far-off places, where it was great to be able to figure out just when the sun had set on that day in the Philippines, or whether there really was a full moon after that shoot in Japan, as I remembered. 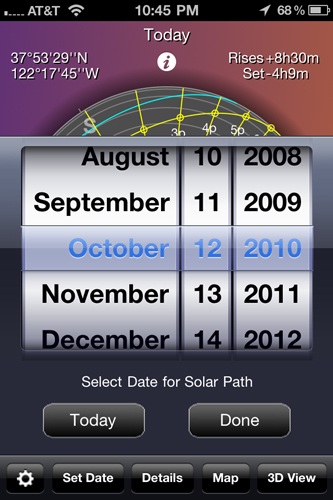 Perhaps some future upgrade of Sun Seeker (or the forthcoming sunPATH app) will incorporate a similar feature. 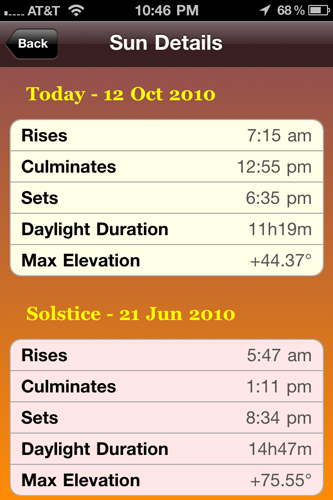 The Details screen on Sun Seeker shows the times of sunrise, culmination, and sunset, the daylight duration, and the maximum elevation for the date of the reading (usually today), and the two solstice dates. Details screen also shows winter solstice. The Map View shows your location at the center of a street map, satellite map, or hybrid, with white arrows to indicate the position of the sun at various times of day, and yellow pin stripes across the whole image to show the path of the sun’s rays and shadows at the moment of the reading. Hybrid Map View. White arrows on lower half of frame indicate direction of sun at various hours. Yellow pin stripes overlay sun’s rays and shadow lines for daytime readings. This view and others could be valuable to preserve for future use, to share with others on the crew. Sun Seeker provides no built-in mechanism to save the Map View, but the iPhone’s own OS allows you to create a frame grab by holding down the Home button and then tapping the Sleep/Wake button on top. This will save whatever is on screen as a 960 x 640 PNG image, usually about 1 MB. A Hybrid Map View taken at night in vertical mode, with no pin stripes. Where Sun Seeker truly shines is in its 3D View. Point the iPhone’s camera at the sky, and Sun Seeker superimposes a yellow line tracing the sun’s path throughout the day against whatever sky, mountain, or building you have in your live frame. It’s easy to see whether the sun will gleam through or be blocked at a specific time of day. 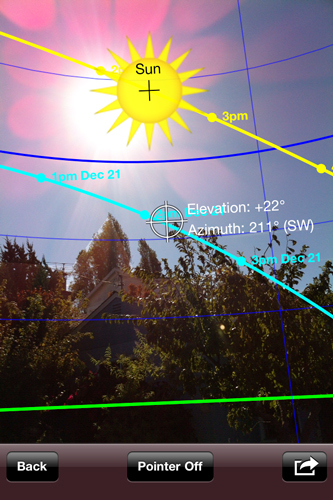 As with the Flat Compass View, you have the option of also seeing red and teal lines which show the sun’s solstice extremes for your location. 3D View. The yellow line shows the sun’s position today. The teal line traces the sun’s position on the day of the winter solstice. 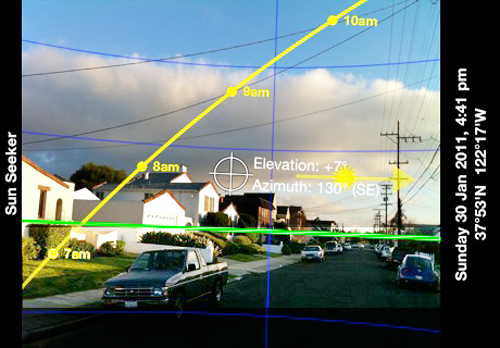 3D View also includes a green line to indicate the horizon, horizontal blue lines for each 10 degrees of elevation, a small sun pointer option (which points toward the position of the sun at the time of the reading, if it’s not in your frame), a large sun (to place over the real sun for improved visibility when the sun is in frame), and cross hairs at the center of frame (which read out the elevation and azimuth of that point). 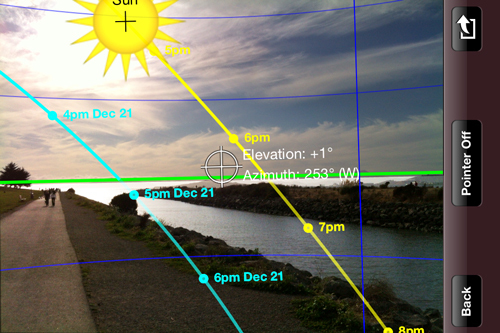 Simplified view, with solstice lines off. Green line is the horizon. 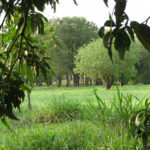 This shot was created with Sun Seeker’s internal Send to Photo Roll command. Other photos in this post were created as iPhone frame grabs. A share arrow in 3D View lets you freeze a moment and Send by Email or Save to Photo Roll. The frames thus saved are 460 x 320 JPGs, lower resolution than full-up iPhone frame grabs. But because each is usually under 100 KB, this feature makes them convenient to email instantly. 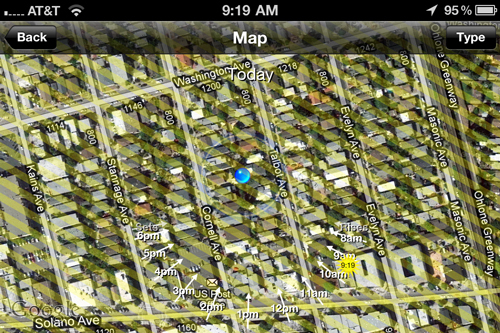 Perhaps this feature could also be incorporated in Map View. Checking tomorrow’s sunset … on a rainy night. Note grey sun below the horizon. Sun Seeker even works at night. Point the camera, and you can see where the sun will rise or set tomorrow (as well as its current position below the green horizon line, indicated by the grey sun). 3D View also works with the camera in vertical position. All in all, Sun Seeker is a remarkably clever, effective, simple and elegant app. It uses the iPhone’s own camera and GPS auto-location functions to create an Augmented Reality view of the sky around you. There’s definitely room for improvement in locations served and Map View saves, but this is a tremendously useful app, highly recommended. And it’s always in your pocket. Looks great; thanks for the heads-up, and the explanation! Cool app, Bill, thanks for the thorough explanation. You’re a wiz! Sun Seeker for you sounds fantastic. This was a great blog but I do take exception to the statement: But by now, everyone has an iPhone or some other smart phone of similar shape and somewhat equivalent capabilities. This should read: “almost” everyone.